This audio CD and booklet presents 10 backing tracks for you to practice soloing. Each track is recorded twice, once with harmonica and once without. Improve your timing by keeping up with a professional group. Develop a bank of riffs while playing with a solid blues backing. Learn new phrasing techniques. Playing along will stimulate your powers of improvisation. Listening carefully to what each instrument is doing will help you emulate it or just blend in, picking up rhythm patterns and playing your favorite melody over some of the tracks. 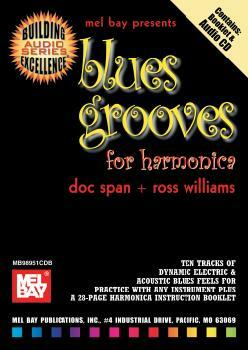 Become acquainted with different blues grooves. It's good fun and great practice whatever your level of proficiency. The booklet contains basic instruction on rhythm, tone, melody, harmony, tongue blocking, improvisation, positions and scales, bending notes, and more.